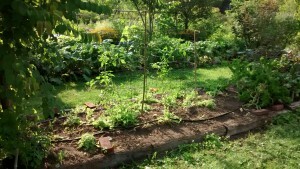 Every spring as the soil warms and the seeds are going in, I’m just so happy to have asparagus. It’s a welcome harvest when everything else is in the planning stage, and a perfect excuse to fire up the grill. Asparagus is a perennial crop, which means it’s one less thing to get in the ground during the busy days of spring, though also of course means that the bed needs to be dedicated to it year-round. However, I’ve discovered by accident that it’s perfectly happy to share the space with Vinca, and may try some other ground covers this spring to see if it has any other good companions. During the summer, asparagus becomes an airy foliage plant with “insignificant” yet bee-attracting flowers. There are a few pests that arrive with the warm weather, but they do little damage and can generally be ignored in garden situations. Damage to plants during the winter is something we gardeners worry about, and after a few questions about it I thought I should write something about how it happens (and how it doesn’t). There are three main causes of winter damage: freezing, breakage due to snow and ice loads, and dehydration. Freezing (or “cold damage”) seems like an obvious problem, but it’s almost never the cause of winter damage on our garden plants. Freezing causes damage when ice crystals form within the plant tissue, which bursts the cell walls. 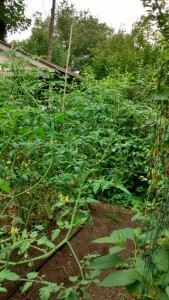 This is what causes tropical plants such as tomatoes, basil, and zinnias to die when the first frost comes. Plants that are perennial here have a defense against freezing: they have anti-freeze! The sap of a plant isn’t just water, but rather is a solution containing salts, sugars, soluble fats, and other phytochemicals that lower the freezing point considerably (just like the solution of brine that freezes at 0ºF doesn’t freeze at 32ºF). Plants that can overwinter to the south of us (“tender plants”) have a sap solution with a higher freezing point than we typically experience during our winters. We often get heavy snows or ice storms in our area, which puts a lot of weight on branches, and if it’s too much weight, they break. This is something we can prevent, through proper pruning. Shorter and thicker branches are more stable than longer skinnier branches. Wide branch crotches are stronger than narrow ones. Dead and damaged branches contain dehydrated wood, which isn’t flexible like healthy wood. This is the worst culprit in winter damage, and is often given a pass because we assume that the damage was due to freezing. It’s also more accurately called early spring damage, because the worst of the harm is done during springs when the air is warm but the soil is frozen. Plants become dehydrated during winter because their pores open during warm weather to pull water from the roots (“transpiration” is the technical word). They do this to enable the cell expansion and growth which we observe as flowering and leafing out. The problem occurs when the plants try to start growing when the water in the soil is bound up as ice. A few plants (notably figs) are very prone to this, but can be helped by protecting them from the wind, which dries them out even faster. From time to time in my travels, I notice landscapes and gardens that show a vintage, with certain plants and combinations that were trendy at the time. The landscapes of the 1980’s and early 1990’s stick out in particular, perhaps because this was the period when I began studying horticulture and design. Not that there’s anything wrong with these features, of course, but it’s an interesting exercise to date the installations. Mugo pines and Japanese red pines at the center of a “border”. Ground covering junipers with a few cotoneasters or winter jasmines (with the junipers mostly just barely hanging on these days). I’ve long been a fan of winter jasmine (Jasminum nudiflorum), though it’s been a few years since it’s really shone in our climate. December 2015 was a banner month for the plant. Most years winter jasmine opens a few flowers at a time on warm days during the winter, providing a bit of hope in the otherwise brown and drab landscape. 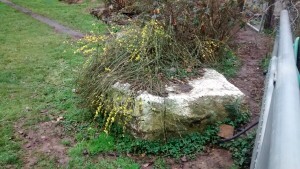 It was a very popular landscape plant in the 1980s, when it was usually planted to cascade over a wall, as it’s thought that the reflected heat of the stone encourages the winter blooms. It’s not used as much today, probably because it’s not always a reliable show, so designers have abandoned them in favor of spreading clematis and other showier plants. Most years the “just a few flowers” aren’t showy enough to make up for its otherwise unremarkable habit, and if the blooms don’t open until spring, they simply aren’t as showy as forsythia and other early flowering plants. The glossy foliage and arching habit are nice, but less so than many other low shrubs. 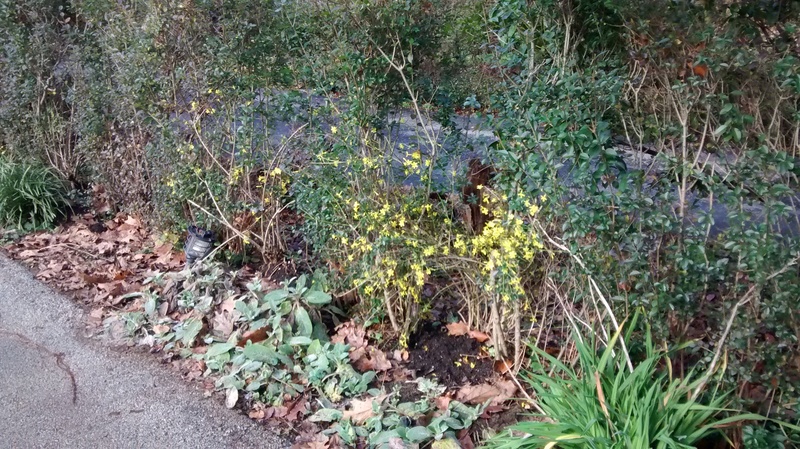 The strangely warm December of 2015 was a banner season for winter jasmine. While the weather was warm and pleasant for being outdoors, there was very little to look at other than the unusually green lawns, unless you happened to have planted it. By Christmas day, the shrubs were in full bloom, showy enough that drivers could be seen slowing down to take a better look. 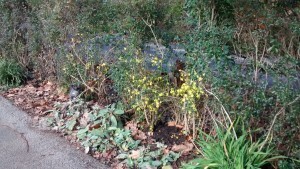 I saw winter jasmine pruned into a topiary years ago, so this autumn I planted some divisions of jasmine in a privet hedge to fill the holes I’d made by removing the Norway maples and barberries that were invading it. The idea is to allow the jasmine to weave itself into the structure of the hedge to help make it denser and give it some seasonal interest. Jasmine doesn’t mind being harshly pruned, so it seems a good match. I hadn’t expected the results to come so quickly, but it looks like it will be a great improvement in winters with warm periods. Leaves fall in the fall, but they don’t all fall at once. As anyone who rakes their own leaves can tell you, it’s a lot easier on a body to rake them once a week or two rather than waiting for them all to come down and then rake them. The same applies if you’re using a leaf blower. Leaves piled on top of leaves are just harder to rake or blow. Leaves on top of wet leaves are a nightmare no matter what you’re using to move them. Wet leaves on top of wet leaves are, well, worse (and also a good way to kill a lawn or garden). Gathering your leaves as they fall is the best for your lawn, gardens, and whomever it is who is gathering them. Whether you call them volunteers, self-sowers, or (like me) welcome weeds, desirable plants that helpfully fill up the bare spots are an important element of a gardener’s garden. They usually start with just a plant or two that’s been intentionally introduced and then allowed to set seed, though sometimes seed can be broadcast for the purpose. Others might be wildflowers from neighboring areas. They are generally not an element of “landscapes”, as they can disrupt the tidy look of pruned plants surrounded by wide margins of mulch. I grew up in gardens that use these plants. My grandmother’s garden always had johnny-jump-ups springing up everywhere, and forget-me-nots in the shadier areas. She also welcomed black-eyed Susans, which eventually took over the garden as she eventually narrowed her focus to just the rose garden and the dahlias. My mother’s garden has had a parade of these plants over the years. Early on we had celandine poppies, columbine, a variegated oregano, and feverfew filling the gaps between the daylily collection. 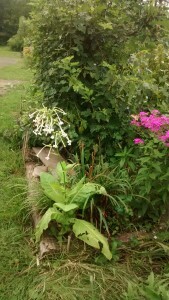 Later Lunaria, lemon balm, and two species of tobacco joined in. 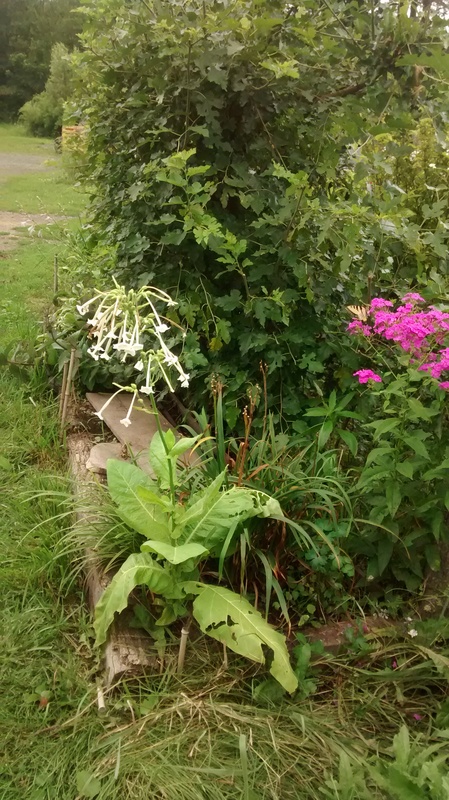 Butterfly weed, Echinacea, Euphorbia, Ruellia, and Patrina found their spots as well, and more recently European gingers and Japanese painted ferns have begun colonizing the garden as it becomes shadier in the way mature gardens do. 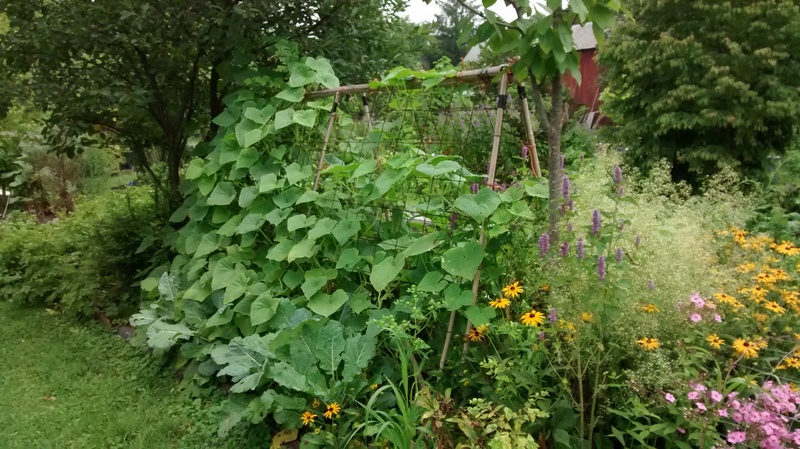 Here on the farm my welcome weeds have included Johnny-jump-up, feverfew, Agastache, perennial bachelor’s buttons, woodland tobacco, blackeyed Susan, and summer phlox. I’ve also welcomed the fleabanes, grass-leaved goldenrod, ironweed, asters, blue lobelias, and Joe Pye weeds that migrate in from the meadows. 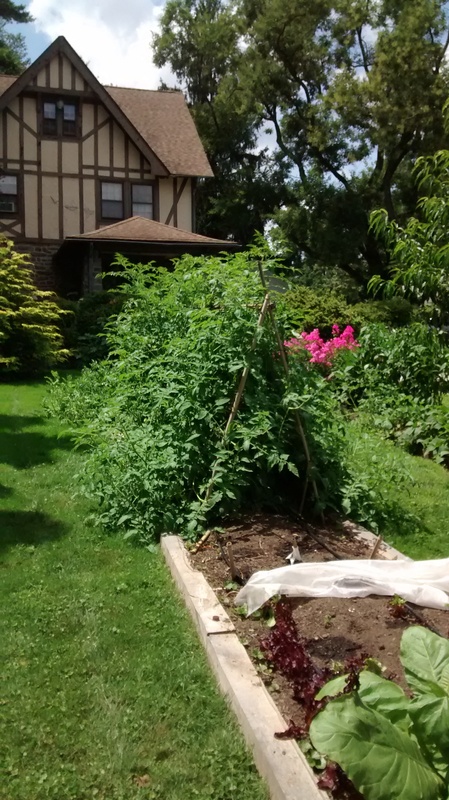 One thing we’ve learned from this multi-generational experiment is to only welcome weeds that are easy to pull should you decide that you don’t want them anymore, or want to keep them confined to certain areas. The Ruellia and the painted ferns, for example, both reached a “critical mass” at some point and started coming up everywhere, which turned out to be a real problem because both plants are very hard to remove once established. 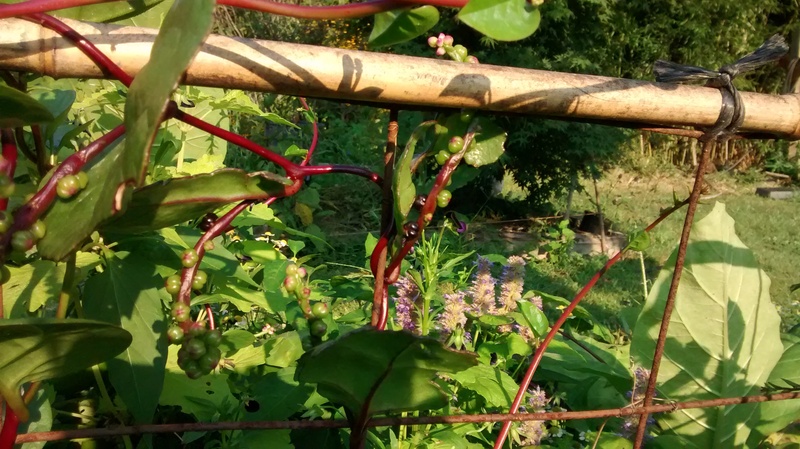 Malabar spinach (Basella alba) is a twining vine with attractive, glossy, succulent leaves and spikes of pink flowers. 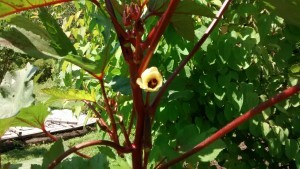 It originally comes from South Asia, and is widely grown throughout the tropics. Planted in spring, it’s rather unimpressive and just sort of sits there, but once the hot weather arrives it takes off and will quickly cover a fence, trellis, or any plant nearby. After years of seeing this in catalogs advertised as a “summer alternative” to spinach, I decided to give it a try this year, planting it on the pea trellis to give some shelter to my peppers. It’s very pretty and I’m very happy with it, so I’ll be growing it again. The flavor of the leaves is mild and spinach-like, and the succulence feels nice in the mouth. According to Cornell the leaves become bitter when the plant produces flowers, but personally I find it a nice bitterness. 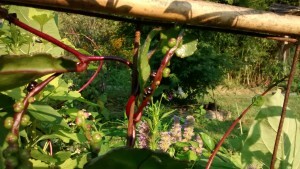 The chickens enjoy the ripe black fruits, so I’m wondering if it will be popping up around the gardens next year. The leaves do not have a long shelf life, and should be used as soon as possible after picking, which presumably is why you never see them at the grocery. 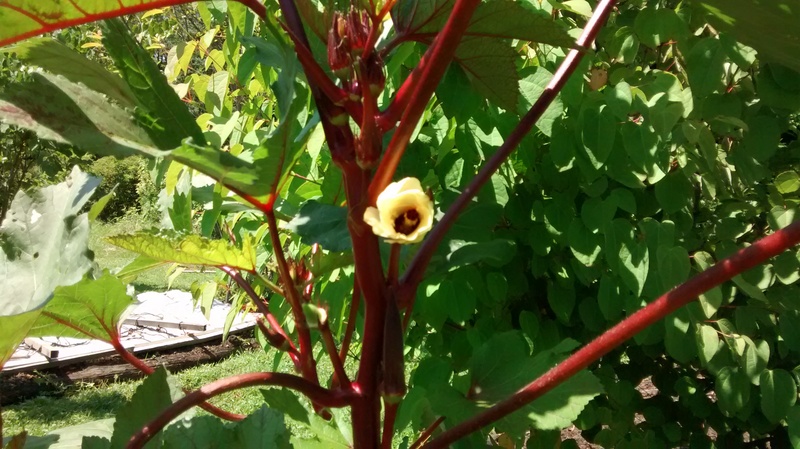 While slow to establish in the spring, red okra is a beautiful plant that adds some mid and late summer interest to the garden, and the pods are a welcome treat, becoming bountiful just as the summer squash have begun to get a bit monotonous. By mid-August the plants reach 6 ft tall or more, resembling small trees. In fact our chickens love to dust-bathe under them, which doesn’t seem to bother the okra a bit. 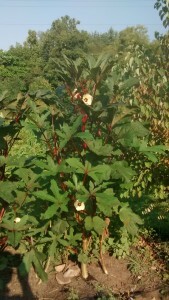 Harvest okra every 2-3 days, the young pods taste the best. A favorite of butterflies and people who love a good perfume in the evening, woodland tobacco (Nicotiana sylvestris) is the plant of the day. Adorning the driveway on the farm. When growing tomatoes, cucumbers, or other fruiting vines in raised beds, you really need strong supports. Those flimsy hoop things at the garden center are useless for plants in good soil. 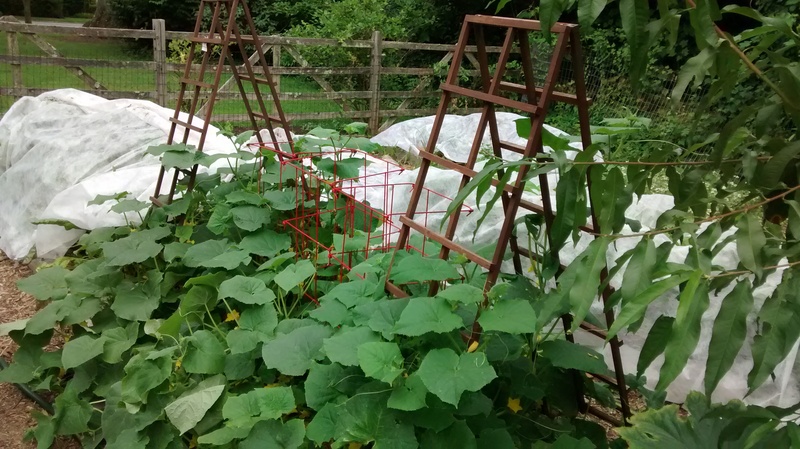 Though with small vines or vines that are planted late in the season, cages will do. Cages work for big plants too, though I find them harder to work with, especially when harvesting. Or have fun mixing and matching supports you happen to have in the garden shed!